"4000 sq. 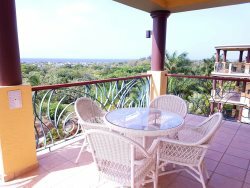 ft. home on a half acre hillside lot overlooking the Caribbean"
Imagine the privacy, comfort and exclusivity of your own private 5-Star resort! This newly completed, modern style home is stunning inside and out with water views from every room! Casa de Sandridge is located on the only beach side street in Lawson Rock, Roatan's most exclusive, guarded neighborhood on the Caribbean. Enjoy snorkeling right in front of the house at the Mesoamerican reef! The house is only 6 miles from the airport and the well-stocked grocery store is even closer. West End nightlife and shopping is just ten minutes away! But, there are great restaurants even closer. You will be close to Anthony's Key for swimming with the dolphins. Zip Lining and Botanical Gardens are also very close. Several dive shops will pick you up from the Lawson Rock pier in front of the house, fishing and sightseeing trips also depart from that pier. This is a dream location for a safe and fun vacation that you, your friends and family will enjoy returning to for years to come! All rooms have air-conditioners and high output fans. This home offers four beautifully decorated bedrooms that are situated to view the water from each of the three floors. The first floor has a queen bedroom and a large bunkbed room with two full size beds below and two twin beds above, each with its own reading light. The room has a massive number of drawers and closet space along with a TV and a desk. Games are stored in the bunk room. The first-floor bathroom contains the tub/shower and double sink vanity and a beautiful mahogany and glass barn door. The adjacent room is just the area for a toilet, nice and private. The laundry is also on the first floor. On the second level, you will enjoy your large open kitchen, living and dining area where large sliding doors open to a large screened in porch where no mosquitoes or no-seeums can bother you as you relax, overlooking the water either sitting at the polished concrete bar, or on the adjacent patio furniture. Cable TV is connected to all three televisions and we provide movies located in the main floor TV cabinet. The third level is a wonderful place to have happy hour in the screened in patio in the infinity edged pool while enjoying the sunset! There is a large patio table and chair set next to the pool. The sitting room next to the pool has a coffee bar with a mini-frig and ice-maker to provide easy access to snacks and drinks while enjoying the pool. You have stunning views of the sunset from this room as well. In addition, there is an open patio for sun bathing that has access to the pool area. The third-floor master bedroom also has a patio to enjoy the tropical breezes and water views while enjoying your morning coffee. This treetop perch has loungers to relax on while viewing the water and the arrival of cruise ships. All bathrooms have two sinks. There is an outside rain-shower provided for rinsing off after a walk on the beach or cleaning scuba and snorkel gear. A large hillside lot full of trees is a beautiful place for volleyball, exploring or napping on the hammock. The marina is reached by walking one lot over and down a colorful tropical garden through a picturesque gazebo. Walk the dock to the end and there is a place to lay your towels, then as you enter the water to go snorkeling you are halfway out to the large reef. For those unsure of snorkeling, there are many smaller reefs in close to shore and fun to explore. Kayaks are available at the Lawson Rock Condo pier. For an additional fee, a chef is available to prepare your meals and shop for you. Mid-week maid service is also available for a small fee. Casa de Sandridge is a Thermasteel construction which they say, “provides the highest R-values available", so the home is very energy efficient. The house was designed for maximum natural airflow so there are many windows and sliding doors so that you get nice tropical breezes. All lights are LED. Every room has high efficient, high output ceiling fans and its own air conditioner so that you can control your electricity costs. The stove, oven and dryer are all use propane for heat to save on electricity costs.